First Christmas Trees 🎄 🎄 🎄 of season arrive! 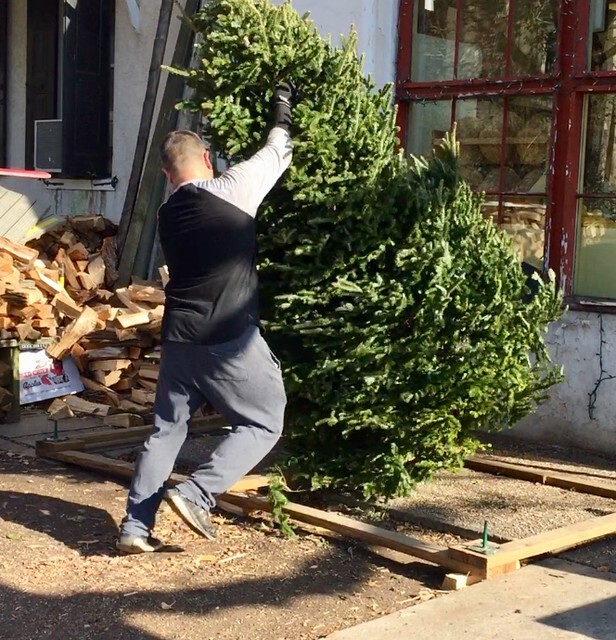 Charlie Gangloff of Top of the Hill market and a helper hoist the first Christmas tree of the season onto an upright the Monday before Thanksgiving. They expect to receive 1000 trees this season, all grown in Bloomsburg Pa, 90 miles northwest of the city. This one is a 9.5 foot Frasier Fir weighing from 75 to 100 pounds. At the end of the season, Gangloff says customers can drop off their trees through a program of the CH Business Association which will donate them to nature preserves where they provide shelter for animals. On the day after Thanksgiving, Gangloff and helpers were busily drilling holes in the bottom of the trees using a special drilling contraption that makes sure the tree will stand erect when mounted on a post. Drilling Christmas tree so it stands straight.